Artist Eleanor Allen Moore (Robertson), who was born in Ireland but lived in both ShangHai and Kilmarnock. She died in 1955. Pictured here in a Self Portrait. SHE was the daughter of the manse with a taste for adventure and her destination was a glamorous, notorious boomtown, the Paris of the East. The astonishing life and jaw-dropping times of Eleanor Allen Moore, who emigrated to Shanghai in the roaring 1920s have fascinated me for years. Now they have inspired my new novel’s heroine who, like the real artist, attended Glasgow School of Art before travelling to China with her husband, a doctor, and their daughter. The opportunity to research her life in the Far East was not one I was ever going to let pass. Moore was one of the Glasgow Girls, a group of talented women artists at the turn of the century; pioneering women who took on the male-dominated arts establishment. Her story began in Ayrshire, where she grew up as the daughter of the manse, when her father was minister in Newmilns, and where she attended Kilmarnock Academy. In 1902, at the age of 17, she enrolled at the school of art, under the training of enlightened director, Fra Newbery, who encouraged women artists at a time when half of his students were female. 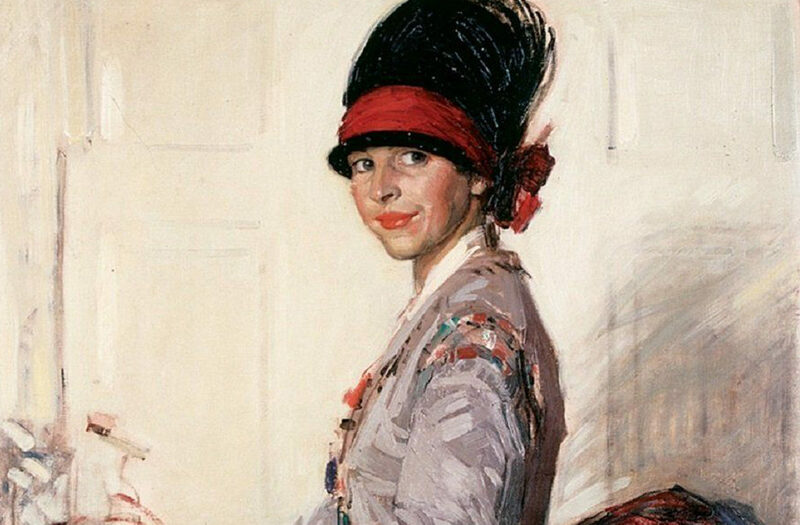 She was just beginning to be noticed in exhibition reviews for her spirited paintings when war broke out in 1914 and she became a Voluntary Aid Detachment nurse at Craigleith Military Hospital in Edinburgh. After the war she went back to painting, usually self-portraits in period dress, as she couldn’t afford a model – The Silk Dress was used for the poster for the most recent Glasgow Girls exhibition. In 1922, she married Dr Robert Cecil Robertson of Kilmarnock, who served in the war in India, where he became interested in tropical medicine. When he accepted an appointment in public health with the Shanghai Municipal Council, the couple headed to China with their toddler daughter. I arrived in Shanghai bedraggled and red-eyed after a 12-hour flight, but Eleanor had a much more stylish and leisurely six-week sea voyage onboard the Patroclus, sailing into the city on the banks of the Huangpu River in 1925. Her first sight of Shanghai would have been of the Bund – an Anglo-Indian word for embankment – a grandiose waterfront of imposing colonial buildings. These were the great trading houses and banks that made the city such a magnet for adventurers seeking to make their fortunes, by fair means or foul. The city was notorious for its pleasure-seeking denizens, the wealthy taipans who ordered champagne by the crate when it came to their round at the Long Bar in the Shanghai Club, and who amused themselves at the races and swanky nightspots where jazz bands played through the night. 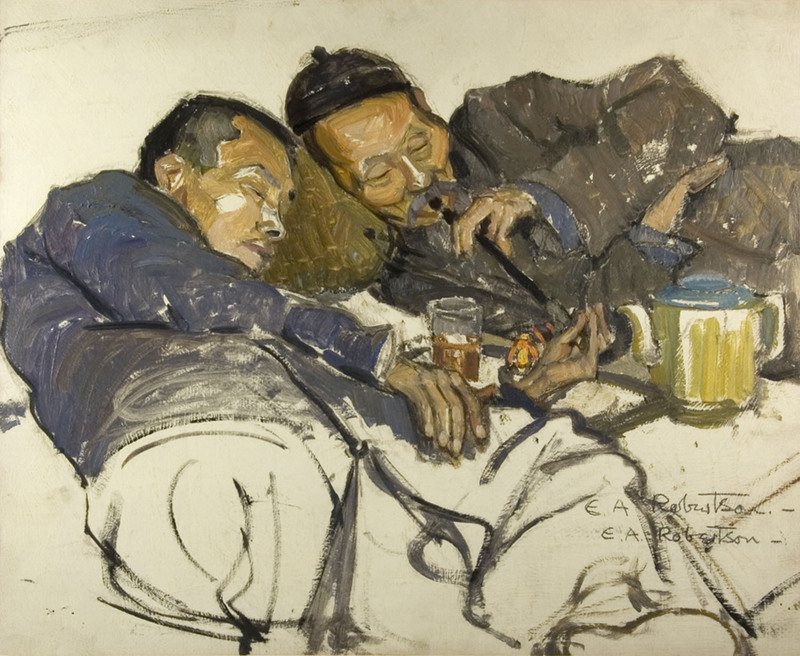 Opium Smokers by Eleanor Allen Moore (Robertson). To get a flavour of the glamorous 1920s highlife of flappers, cocktails and jazz, I visited the Fairmont Peace Hotel, which in Eleanor’s time was called the Cathay and was the place to stay. It’s a beautifully preserved example of Art Deco luxury and would have looked much the same when it played host to Charlie Chaplin and Noel Coward, who wrote Private Lives there in four days when he had the flu. But it wasn’t all dancing and parties. China was undergoing political upheavals and foreigners were confined to the relative safety of the International and French Concessions, where they had their own police force and justice system. During the troubled periods when anti-foreign feeling was strong, Eleanor’s husband, a member of the Shanghai Volunteer Force, patrolled the boundaries in an armoured car. During more peaceful times, the couple explored the surrounding countryside in their houseboat, the Bluebird, which was towed by steam launch or moved by a crew using long bamboo poles. To escape the heat and bustle of the city in high summer, they meandered through the creeks and canals of the Yangtze Delta, exploring the water towns Suzhou and Hangzhou. I went by the super-fast bullet train to these places and saw why they appealed to Eleanor’s artistic eye. Suzhou – known as Soochow in her time – was called the Venice of the East and one of her favourite destinations. Many of her prettiest watercolours are of the humpbacked bridges over canals, the weeping willows fringing the water, and the pagodas I also admired in this ancient town. Daringly, as a foreign woman, Eleanor braved the Shanghai’s Chinese old town and ventured into the notorious opium dens to sketch those smoking inside, as well as street scenes of ordinary Chinese people going about their business. Today, the lanes or lilongs in Shanghai still offer an intriguing glimpse into everyday Chinese life and I wandered through the lanes in the French Concession, among people hanging out their washing, playing mahjong and drinking tea in their doorways. Shanghai in the 1920s and 1930s was a dangerous, lawless place, its criminal underbelly run by vicious gangs, or tongs. Eleanor’s husband was even kidnapped once, but managed to escape from the kidnappers’ car with a bullet hole through his coat. He and Eleanor lived in one of the gracious European-style villas in the concessions. She would have been driven around in her own car or travelled by taxi and rickshaw through broad streets with poetic names like Bubbling Well Road and Avenue Joffre. Today, these streets, now West Nanjing Road and Middle Huaihai Road, are busy designer shopping streets packed with cars, scooters and bikes whose riders seem to have no sense of their own mortality. I spent happy hours walking through the leafy boulevards of the French Concession, lined with plane trees, the air scented with sweet Osmanthus blossoms. A local historian from the Royal Asiatic Society took me to a gated lane in Frenchtown to show me the kind of garden villa Eleanor would have lived in. The three-storey house with its garage, garden and courtyard, was now run down, occupied by several Chinese families who hung out of the windows and watched with interest as I peered up the crumbling stairwell through the dust and gloom, at the rusting servants’ bells and the cracked ornamental floor tiles in the hall. In August 1937, her gilded life ended abruptly when British women and children were evacuated to Hong Kong during the conflict with Japan. Eleanor left Shanghai and never returned. Back in this country, with modern art in vogue, she felt left behind and didn’t paint much. She died in Edinburgh in 1955. Walking the same streets of Shanghai as Eleanor, and experiencing the same sights, smells and sounds, gave me a unique insight into the rich, colourful life of this intrepid Scotswoman.